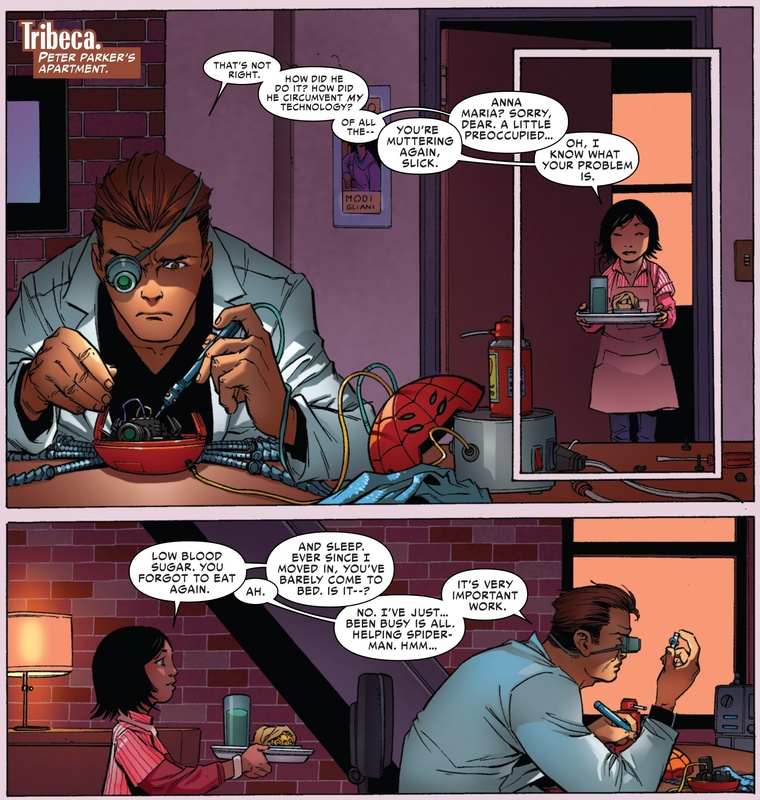 Superior Spider-Man #27 – Should old acquaintances be forgot? I have never liked Spider-Man. Perhaps I should rephrase that, I have never liked Peter Parker. Last year when the inveterate Amazing Spider-Man culminated in a feat of villainous debauchery, Dan Slott underwent a voyage of the damned. Not only had he ended the life of Peter Parker, he served to desecrate his legacy by having Spider-Man live through his archenemy Otto Octavius. Though I speak emotively this venture has been an incredible journey, and Dan Slott has proven himself as a writer and as an innovator. “To kill your darlings” is what he did and it was no mean feat. The level of vitriol he received was inordinate but he persevered and told his story, Doctor Octopus as Spider-Man. To say that it was a success is understating the impressive double monthly shipping schedule and the persistent level of quality it maintained. For me the real question is why has it taken twenty-seven issues for me to review this book? I like Dan Slott, I really do. His affable nature and geniality made me dedicated to his work, despite my reservations about his style. Reading the final twist of Amazing Spider-Man #700 left me impressed with the idea but not at the execution. I found it a little rushed and abrupt and gave little time to appreciate what was unfolding with seemingly no build. The shock was all-important and I remained unconvinced that Otto had a reason for becoming a superior hero. Over this past year I have immensely enjoyed this book and that is because it has been well paced and delicately built. despite the odd snappy caveats to his writing. Slott’s dedication to superior is absolute and wholehearted, as he has built his protagonist into a character of real substance despite the incongruity of a villainous hero. In many ways he has proved superior and Otto’s megalomania and supreme intelligence has helped him to devise a seemingly full proof security system and detail. In doing so he has deviously manipulated almost all those around him including J Jonah Jameson, Aunt May, MJ, the Avengers and numerous other figures in Petey’s life. He has become a well-oiled machine in the superhero craft and has radically improved Parker’s life by attaining a degree, being available to his family and moving in with a new love interest. I am not sure what to make of the genetically short stature girlfriend who is well educated and just lovely, except that she sees the best in Doc Ock whilst many others only see the worst. She brings out the warmth in Octavius and her role in his eventual demise will only devastate. Throughout this series there have been undertones of a Peter Parker return. There was even a potential moment squashed by Ock mid way through the run, but we all known it is inevitable. Carlie Cooper, a one time romantic interest of Parker’s has always been wise to the game, even prior to superior. She suspects strange goings on and calculated that there was a body swap, only to have been kidnapped by the Goblins. Goblin Nation #1 is the final arc of this book and with it all bets are off. 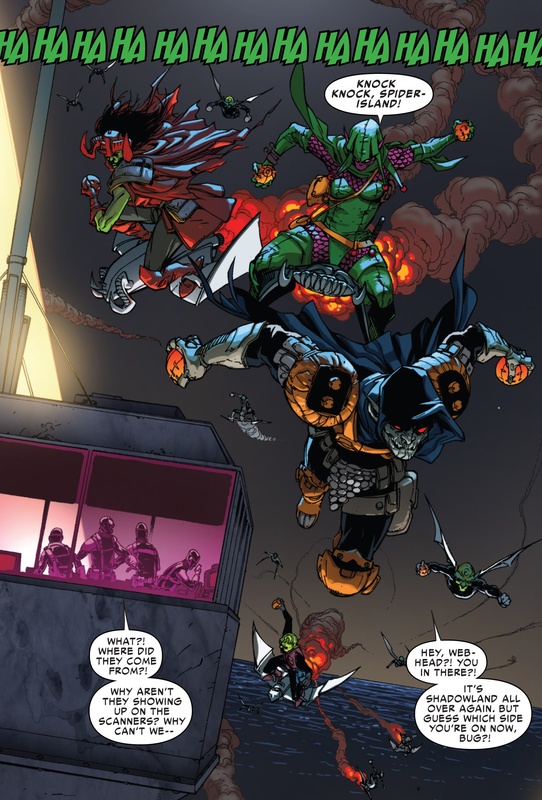 The identities of the Green Goblin and the Hobgoblin have been revealed and in forming an army of drooges and scoundrels, they are about to launch a full scale frontal assault on Spidey Ock and his Spider patrol. This is a fascinating story because these characters have been cameos for many an issue, whilst Spider-Man has been facing B and C-list villains. The signs were all there and now it is coming to fruition and the arrogance of Dr Octopus veiled his eyes to what was occurring beneath his city. This run is a perfect lesson to other writers in planning and execution. Slott refused to let us scratch that itch, but now he revels in our enjoyment of the confrontations we have been desperate to see. Suffice to say, it does not disappoint. JJJ’s vengeance is building with venom whilst the real Peter Parker’s determination to come home is almost bearing fruit. All the while the tête-à-tête between Spider-Man and the Green Goblin is a delectable battle of evil masterminds, and just when you think Goblin’s deceit has everyone fooled, Ock surprises us all. Most importantly Slott writes simply and effectively without any ridiculous surprises or admonitions. This is a story told well and true. Camuncoli takes the pencils from the regular team of Ramos and Stegman, and carries the torch with passion. He draws a steely-eyed Parker full of grit and angst, without the chirpiness of Petey. In costume In fact most of his characters speak through their eyes, including the malicious intent of Jonah and the deviousness of the Green Goblin. The confrontation between Spidey and Goblin is drawn wonderfully, including the use of hand gestures combined with letterbox panelling and demonstrations of power. 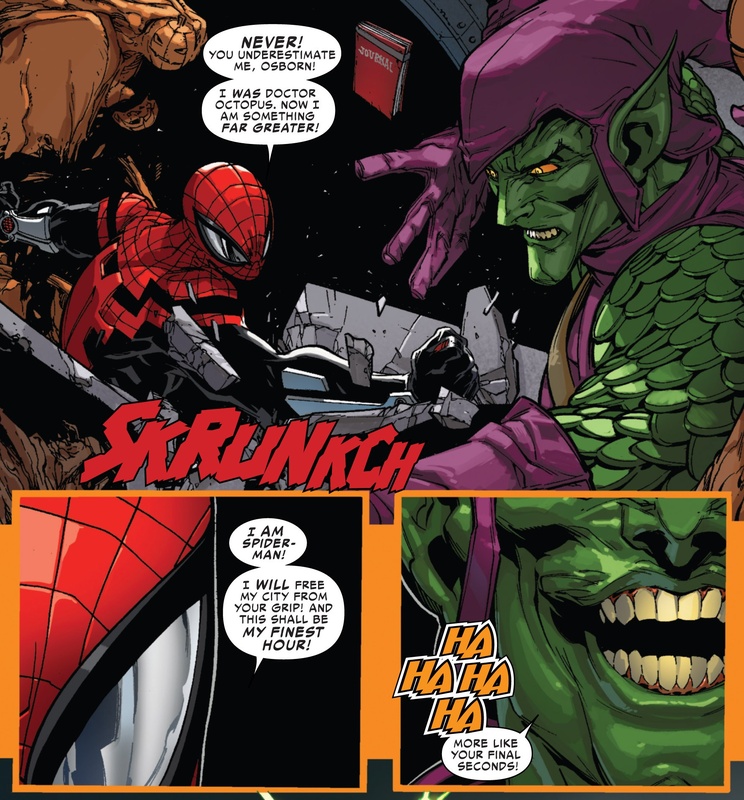 The double box panel of grandstanding, focusing upon Spider-Man’s eyes and Goblin’s cackle, is just amazing. Though not really given the opportunity to, Camuncoli is very comfortable with the cityscape scenes, especially when they are filled with Goblin minions and projectile explosives. He is a welcome addition to the artist assembly of the Superior Spider. The ultimate aim of this book has to be to tell a compelling story and to garner affection for Spidey Octopus. I may not be the best judge because of my predilections against Peter and my love of villain stories, but I will say this: there is far more conviction and depth of character to Spider-Man than there has ever been. 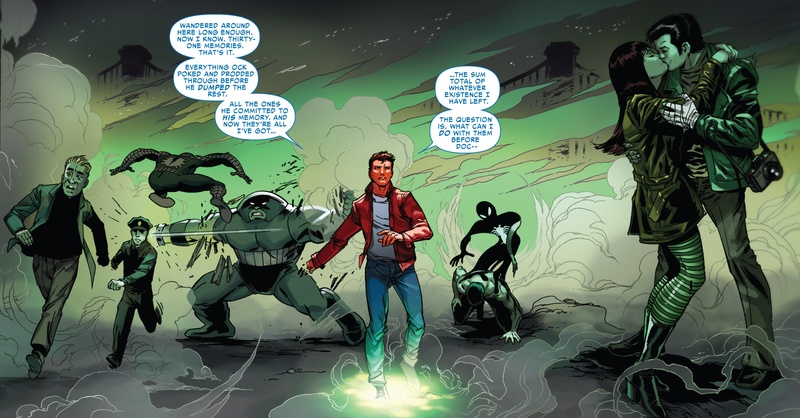 Dan Slott has completely reshaped Peter’s life and has given attention to the rapport with previous acquaintances of Parker, old lovers of Ock and interacted refreshingly with established enemies. It is momentous achievement to keep this book novel and inspired, and to do it subtly and not jump immediately into the big clashes. The initial spirit of Parker influencing Dr Octopus’ decisions acted as a stepping-stone to complete exile of our beloved hero. During that time we witnessed the fragility of Otto’s disposition, especially when he begins to doubt and berate himself for making errors. This issue begins as such. His constant comparing to his predecessor reflects the insecurities he desperately tries to deflect from his own ego. His passion for science and technology and to the people he actually cares for is endearing. He refuses to accept that he is a slave to the city and formulated a project that lets him accomplish all he wishes. This determination and compromise addresses the constant double identity issues with ease. It is not always ideal and at times, innocent people are placed at risk, which is not as easily justifiable as Octavius makes it. However his successes speak for themselves but the cost is only just becoming apparent. Spider-Man’s enemies are unifying in a massive assault on Spider Island and Otto has burnt his bridges with the superhero community. Most importantly the family and friends that love Peter are casting aspersions on his character. Will Dr. Octopus’s superior intelligence guide him through the oncoming storm? Will he need help from others but more pertinently will his arrogance allow him to accept it? Will he succeed where Peter has failed? What is it that makes a Superior Spider-Man? I continue to read with admiration as Dan Slott pushes the definition of superior to its breaking point.